The soft pink and pale blue are a bit sugary for many gardeners but the idea of tall spiky plants flowering together inspires other combinations. 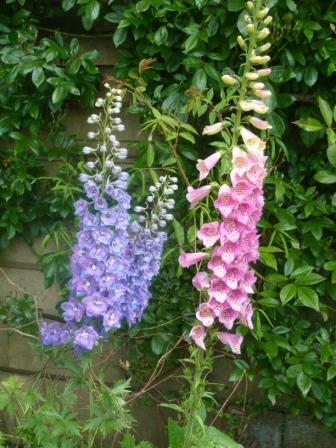 The Delphinium is perennial whilst the Foxglove is biennial and has been placed just in front of the Delphinium to get the effect. The spikes inspire both in colour and architectural shape. A Califonian Lilac Ceanothus impressus has bursting blue flowers and could be under planted with Bellis Perennis Pompomette a double daisy in shades of pink. Avoid the red Bellis plants as they will clash. Silene schafta is a magenta -pink and for low growing rockery plantings it can be mixed with the blue Campanula porteschlagiana. Bearded Iris have many strong blue varieties and pink Peony Sarah Bernhardt will make the blue and pink connection with mixed foliage shapes and textures. In mid spring we are familiar with the Jan Boss and Delft Blue hyacinths but I find the contrast fails to inspire me and I would go for a different combination. Other colour combinations are as varied as your imagination but try get plants that flower at the same time and for similar lengths of time. 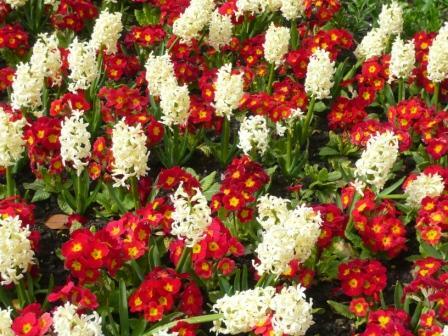 These hyacinths and polyanthus made a good show for serveral weeks before they were replaced with new bedding. White goes well with virtually all colour schemes but cream which tends to get washed out by the white.